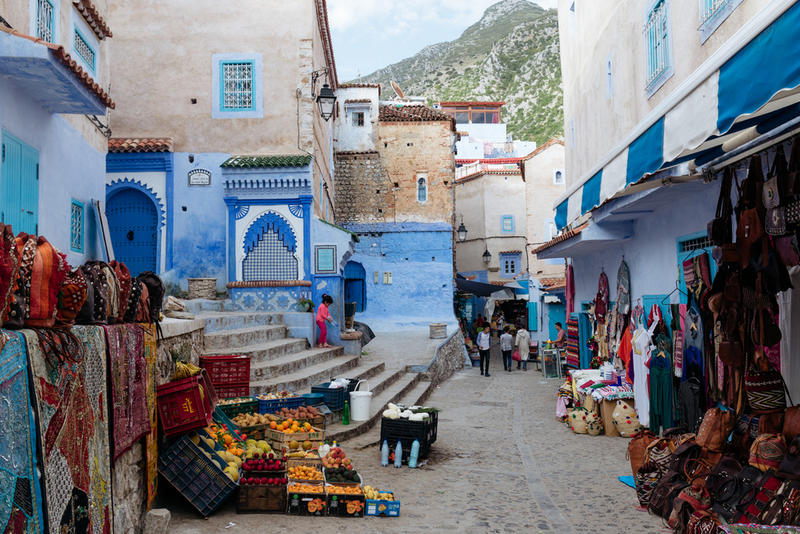 Morocco’s small city of Chefchaouen—often referred to as simply Chaouen—is one of Morocco’s most picturesque destinations. 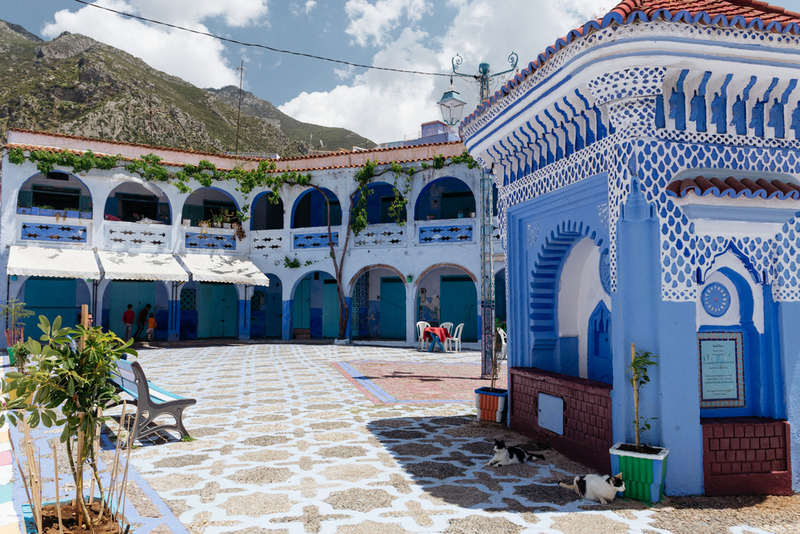 Nestled in the glorious scenery of the Rif Mountains, it boasts one of the country’s most charming medinas and is famous for its varied shades of blue paint that cover the walls. Chefchaouen was founded in 1471 by Moulay Ali Ben Moussa Ben Rached El Alami, a distant descendant of the Islamic Prophet Muhammad. 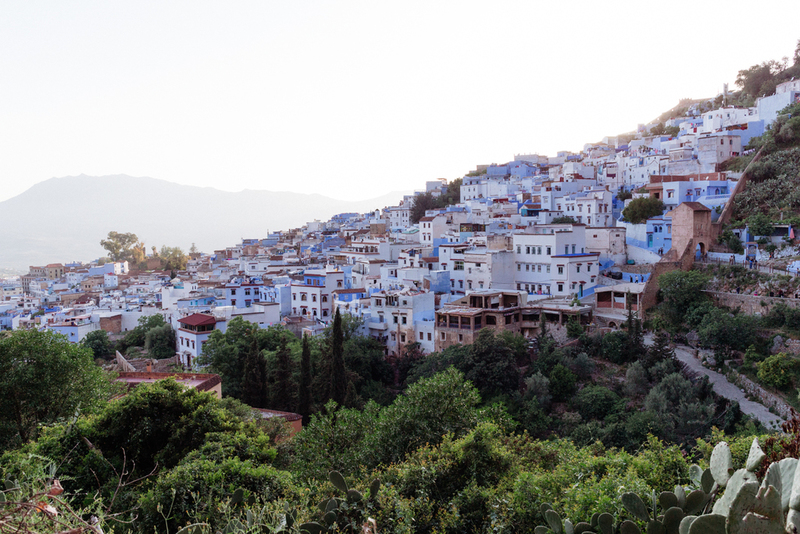 The original settlement consisted of just a small fortress, now referred to as Chefchaouen’s kasbah. The fortress was erected to help defend the area from potential attacks by Portuguese invaders since at the time, Portugal was launching attacks against northern cities and towns in Morocco. A settlement eventually grew outside of the fortress with the construction of the medina, a traditional walled area of homes and other buildings. During the Middle Ages, local tribes, Moors from Spain, and Jews populated the area. 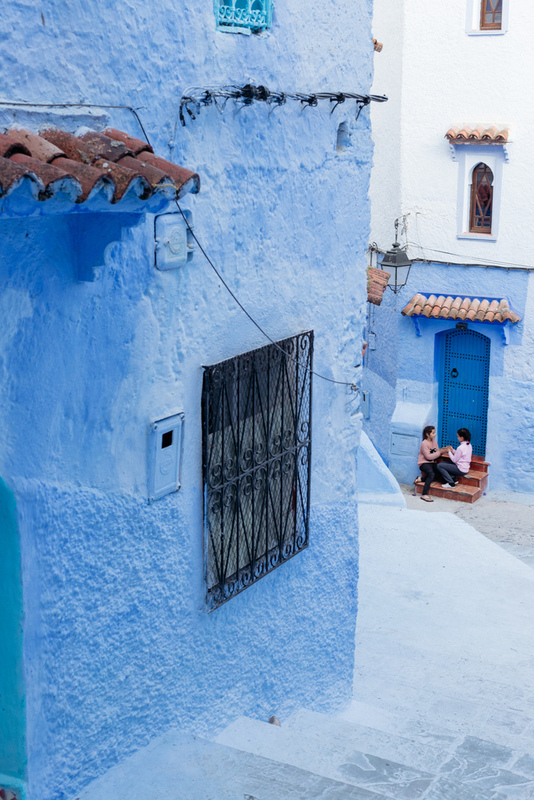 Many years later, the Spanish captured Chefchaouen in 1920, forming part of Spain’s territory in Morocco. The area saw a large influx of Jews fleeing from Europe and Hitler during the Second World War. Most Jews later left the area in the late 1940s and early 1950s to live in Israel. The city was given back when Morocco gained independence in 1956. In Jewish beliefs, the colour blue represents the sky, which in turn reminds people of heaven and God. There is, therefore, a strong tradition among Jewish communities of painting things blue and using blue dye to colour fabrics, especially prayer mats. So what caused blue fever to spread throughout the entire medina? 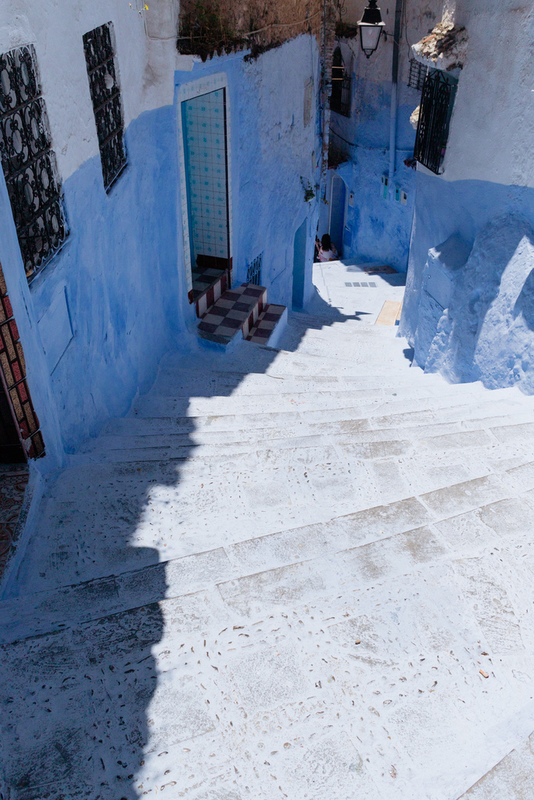 Some people believe that early Jews in Chefchaouen introduced the practice of painting walls blue, in keeping with their religious and cultural practices. 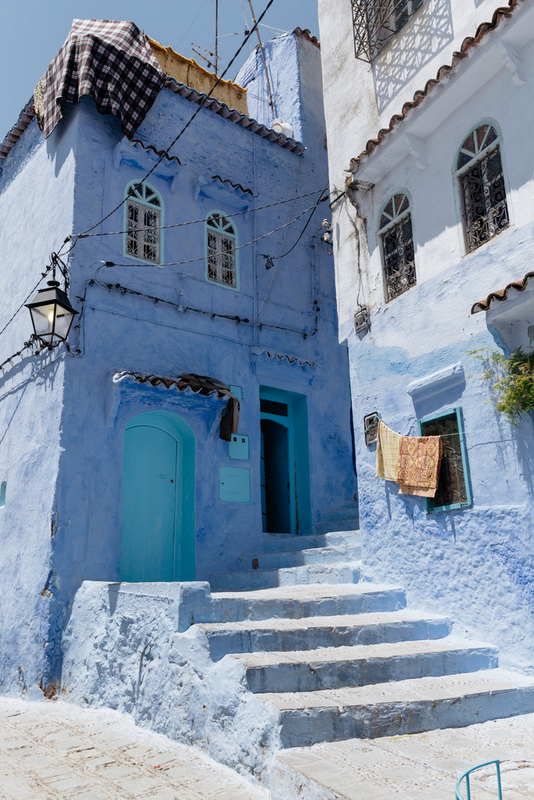 Many locals say, however, that the blue-coloured walls of Chefchaouen were only found in the Jewish part of the city, the mellah, until fairly recently. 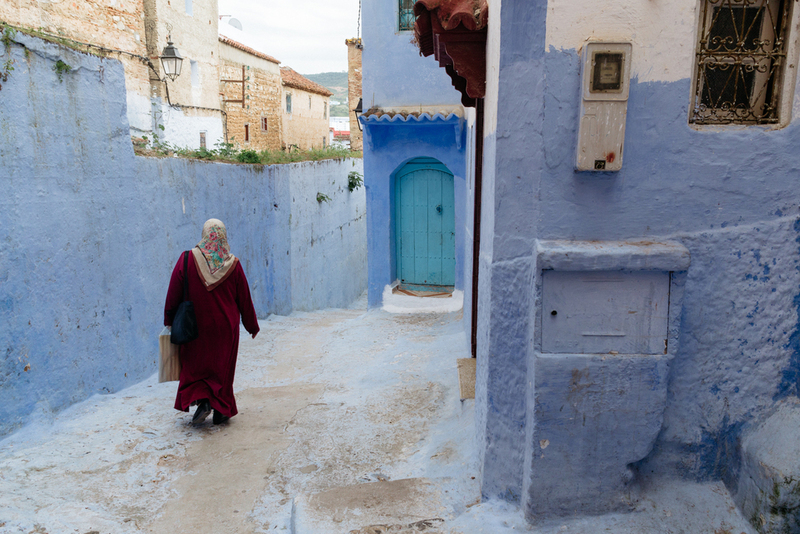 Older residents say that most of Chefchaouen’s buildings within the medina used to be white during their younger years. Painting the walls blue likely happened in the 15th century, shortly after the city was founded. Some people say that the wave of Jewish immigrants in the 1930s was responsible for adding more blue hues to the city. With historic tensions between Jews and Muslims, it is unlikely that the local Islamic people knowingly replicated Jewish practices. There are those who believe that shades of blue adorn the city to help deter mosquitoes. Although mosquitoes generally choose to live near water, they don’t like being in the water itself. 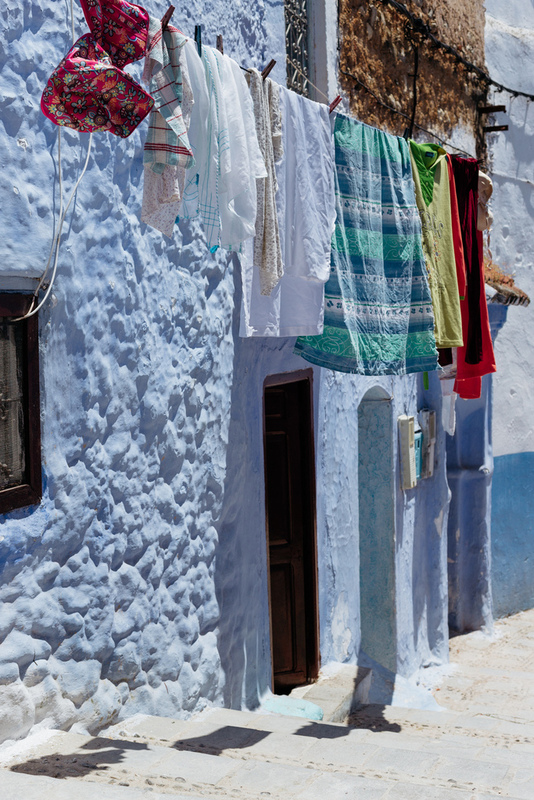 The colours of Chefchaouen’s buildings certainly can look like flowing water. It is possible that residents noticed fewer mosquitoes in the Jewish part of town and decided to follow suit to rid their homes of pesky bugs. Some locals say that the blue helps keep their homes cool in the warmer months. While this probably wasn’t the original intention, it serves as a valid reason as to why the painting continues in modern times. 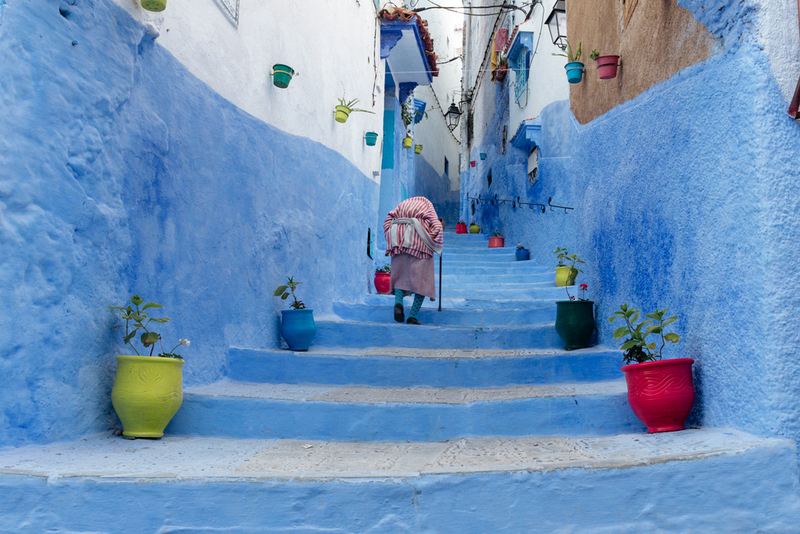 Chefchaouen’s walls are daubed in all shades of blue to represent the colour of the sparkling Mediterranean Sea, according to some locals. Others, on the other hand, believe that the blues symbolise the importance of the city’s Ras el-Maa Waterfall where citizens get their drinking water. The essential life-sustaining water allows a community to thrive in an otherwise-hostile environment in the arid mountains. Ask some locals why the city is blue, and they may say it’s simply because blue looks attractive and has a calming effect. In Islamic culture, blue is said to be a colour of happiness and optimism. Others might add that it’s just what everyone does there, reflecting the idea that communities in Morocco like to show a united front. Could it be that a few homes close to the mellah liked the colour originally painted by Jewish settlers and decided to copy it, thus starting a new trend that spread from home to home? While this certainly wouldn’t have been the original reason for painting the city, attracting tourists is a major reason why the practice continues. The unusual colour is, after all, the city’s main claim to fame. Chefchaouen was previously an unremarkable destination along the trading route between Fes and Tangier. It is now, however, a fairly popular tourist destination. It’s clear that whatever the initial reasons were for painting the city, there are several benefits for continuing to get the paintbrushes out. 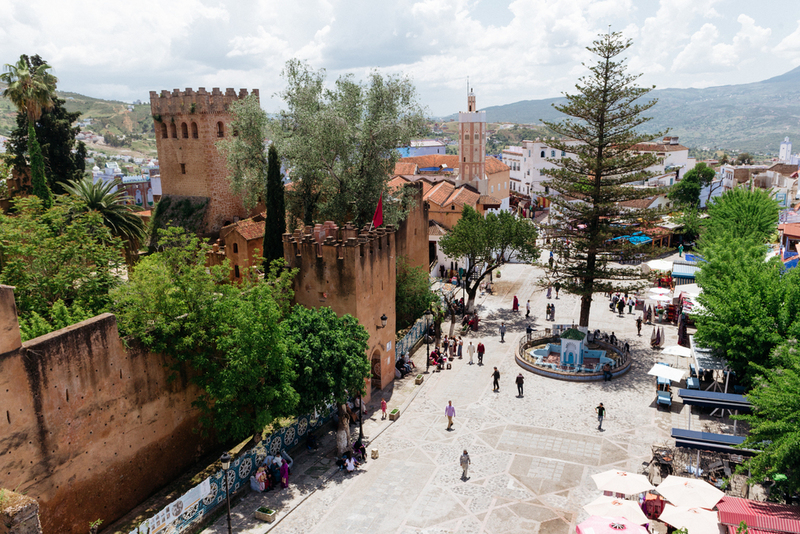 Apart from the nearby natural attractions and activities, such as hiking in the mountains and visiting the Cascades of Akchour, one of the main things to do in Chefchaouen is to wander through the city’s medina and admire the picturesque scenes that unfold around each corner and down every staircase. 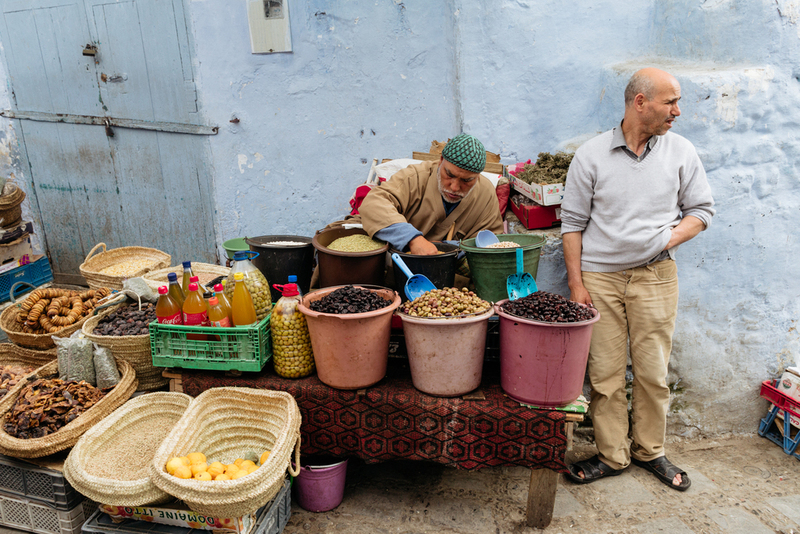 Less frenetic than in other cities in Morocco such as Marrakech and Fes, visitors can pick up an array of traditional-Moroccan goods. Blue and white paintings on different-sized canvases depicting scenes of the city and local life are especially nice keepsakes. Within the old kasbah itself and its shades of brown, beige, muted red, and ochre, tourists will find the small Ethnographic Museum, sometimes also referred to as the Kasbah Museum. It houses exhibits and displays related to the area’s history, culture, and development. Do be aware that most explanatory signs are only available in Arabic and French; having a basic knowledge of either would add more depth to a visit.